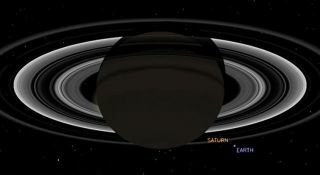 Get ready to wave at Saturn this week. NASA's Cassini spacecraft currently orbiting the ringed planet is will take a picture of Earth from as it looks from Saturn on Friday (July 19), and every Earthling can participate. "For those in the [United States], step outside (or stay inside) and wave low on your eastern horizon (southeast in the central and eastern U.S.) as Cassini’s cameras take a series of pictures over about 15 minutes in the afternoon of July 19,", Jane Houston Jones, a member of the Cassini education and public outreach team, wrote in a blog post about the Saturn photo event. The event is timed to take place between 5:27 and 5:42 p.m. EDT (2127 and 2142 GMT), she added. Interested members of the public can also participate in an Astronomers Without Borders project focused on amateur photography and the ringed wonder. Officials from AWB are asking people around the world to send in photos of Saturn taken this year for a mosaic project associated with the upcoming Cassini image. AWB officials will combine the photos they receive of the ringed wonder into a mosaic that will resemble the photo produced by Cassini. Participants and other interested parties will be able to zoom in on specific photos that compose the larger image, ideally giving stargazers an idea of what Saturn looks like in skies around the world. Take a wide-angle photo with Saturn in the sky the background and Earth in the foreground. Take a photo of people looking at Saturn during [a Saturn viewing] event. Hold an event. Invite the neighbors, family and friends. Take your telescope to the sidewalk. No telescope? No problem! Point out Saturn in the sky and explain what's happening. Have a picture taken with Saturn, the "star" of the event. Project a live image Saturn on a wall from a telescope if you can. Project a photo of Saturn from a computer. Print a photo and tape it up. Make a banner of Saturn. Make a cut-out, a foam Saturn, or a CD Saturn. Be creative! Create a "Photo Booth" for photos of your visitors with Saturn as a souvenir of this historic event. NASA has a long history of taking amazing photos of Earth from space. On Dec. 7, 1972, the crew of the Apollo 17 mission took the first full-view photo of Earth captured from space, known as "The Blue Marble." In 1990, the Earth portrait called the "Pale Blue Dot" was taken by NASA's Voyager 1 probe from beyond the orbit of Neptune. Cassini has already taken two photos of Earth from its position in the Saturn system. The spacecraft arrived in orbit around Saturn in July 2004 and was launched in 1997. It is expected to study the ringed wonder and its moons until 2017. You can learn more about the Saturn mosaic project and submit a photo on the Astronomers Without Borders website. Editor's note: If you have an amazing night sky photo of Saturn or any other celestial sight that you'd like to share for a possible story or image gallery, please contact SPACE.com Managing Editor Tariq Malik at spacephotos@space.com.